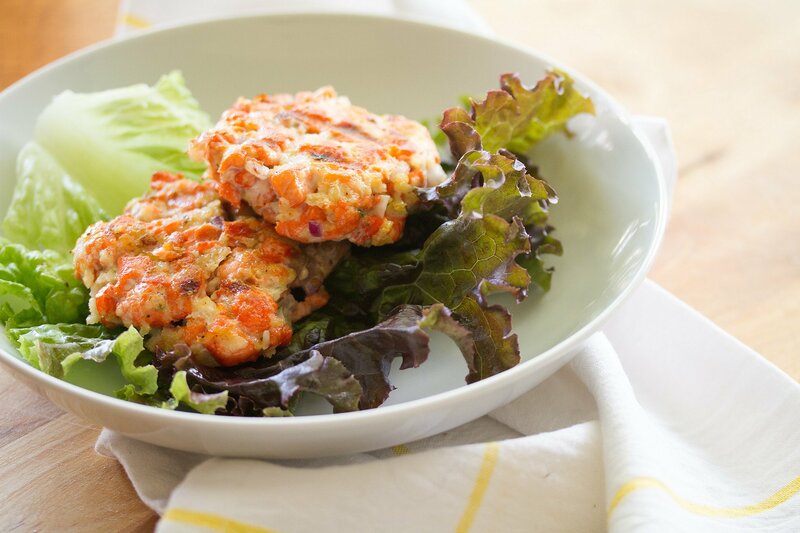 →5 Best Salmon Patties Without Eggs Recipes You Need To Try! 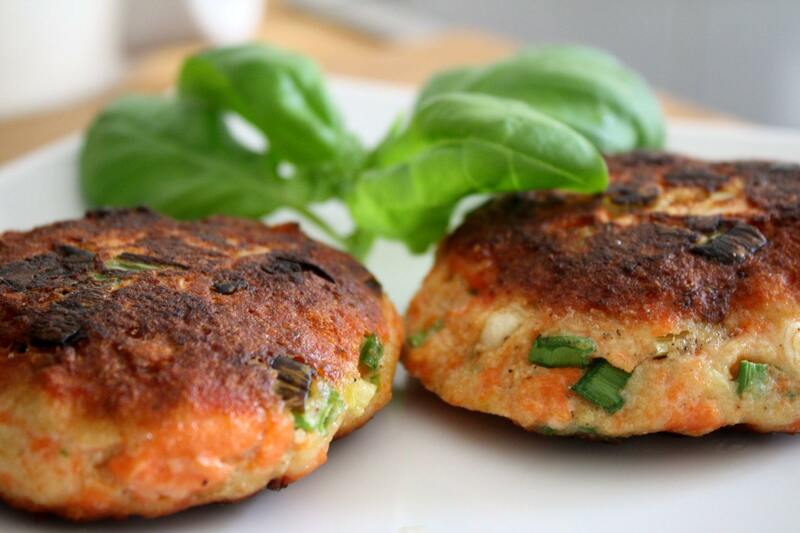 5 Best Salmon Patties Without Eggs Recipes You Need To Try! If you like salmon patties but you are allergic to eggs, don’t quit yet because there are many salmon patties without eggs recipes you can choose for your family. Just keep in mind that you are not the only one who likes salmon patties without eggs. My husband and kids like them as well because they are allergic to eggs. The importance of eggs in salmon patties is to cohesively bind the ingredients together. At first, it was a challenge finding the best recipe that doesn’t contain eggs as one of the ingredients. After some thorough research over the internet and numerous recommendations from my fellow moms, I discovered a number of recipes that use alternative binding ingredients. 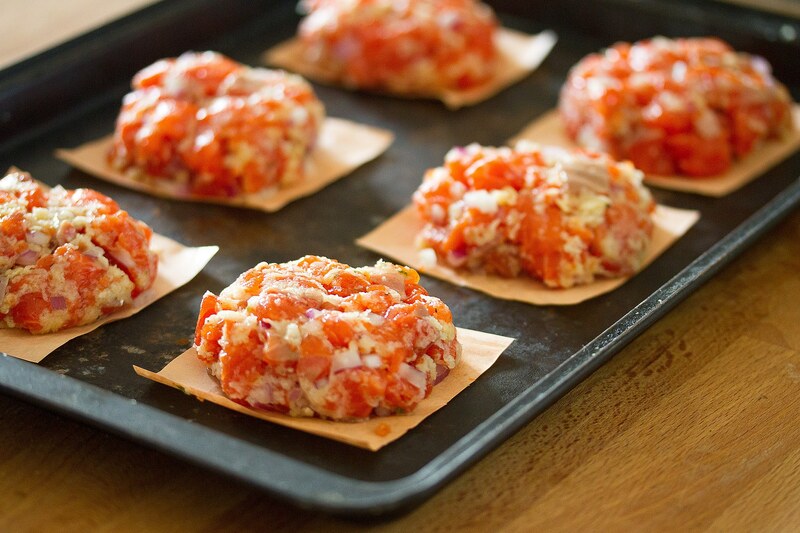 This is a quick and easy to make salmon patties without eggs prepared from just 5 ingredients. You will need 3 minutes to prepare the ingredients and 5 to 10 minutes to cook these patties. Per serving of these patties contain al 11 g fat, 7 g saturated fat, 70 mg cholesterol, 120 mg sodium, 20 mg calcium, 390 mg potassium, 30 mg magnesium, 9 mg carbohydrates, 1 gram dietary fiber, 1 g sugar, 21 g protein, and 54 % of Vitamin A and C.
The following are five ingredients you need to prepare 4 to 6 servings of these healthy-packed salmon patties. Drain can of wild Alaskan pink salmon, and add the meat to a large bowl. Remove bones from the fish. You can choose to eat them or decide to throw them into the patties. Add remaining four ingredients to the large bowl containing the wild Alaskan pink salmon and mix until they combine evenly. ​Place the fat of your choice over a medium-sized frying pan and heat it for about 2 minutes. ​Divide the salmon mixture above into 8 parts. Roll each part into a ball and then flatten them into a patty shape. Place the pieces carefully into the hot oil and fry them for 3 to five minutes until they turn brown. To maintain the shape of your patties, handle them carefully. If you are of those people who find it hard to pass fish patties with a spicy kick of red curry, you haven’t tried Thai salmon patties. You will need 20 minutes of to make 12 serving of these easy to cook patties. 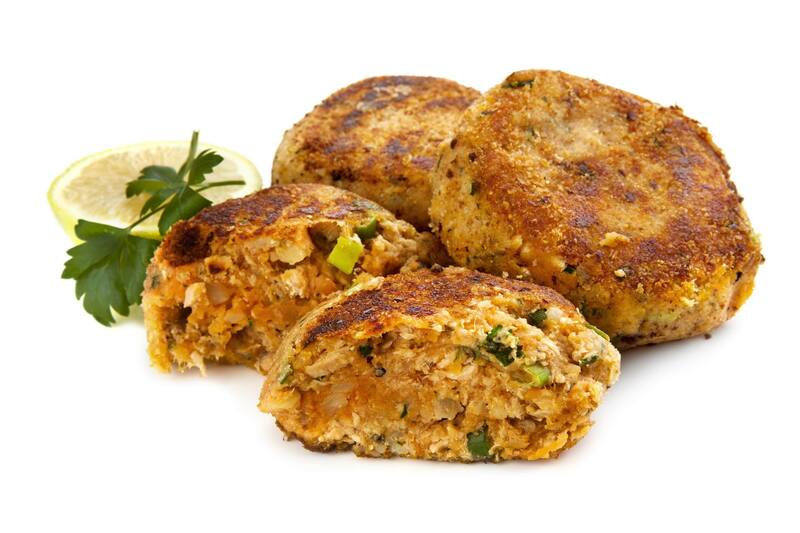 The following are ingredients you need to prepare 4 servings (12 pieces) of these healthy-packed salmon patties. Cut Tassal salmon portions into chunks. Put the salmon chunks, lemongrass, spring onions, coriander leaves, lime juice, green chilli and rind into the food processor’s bowl. Process the mixture until well combined. Shape mixture above into small patties. Put olive oil in a medium frying pan and heat it over medium heat. Place the shaped pieces into the pan and cook for 3 to 4 minutes on each side until they turn golden. Remove them from the pan and place them on a serving platter garnished with sliced cucumber and pineapple. 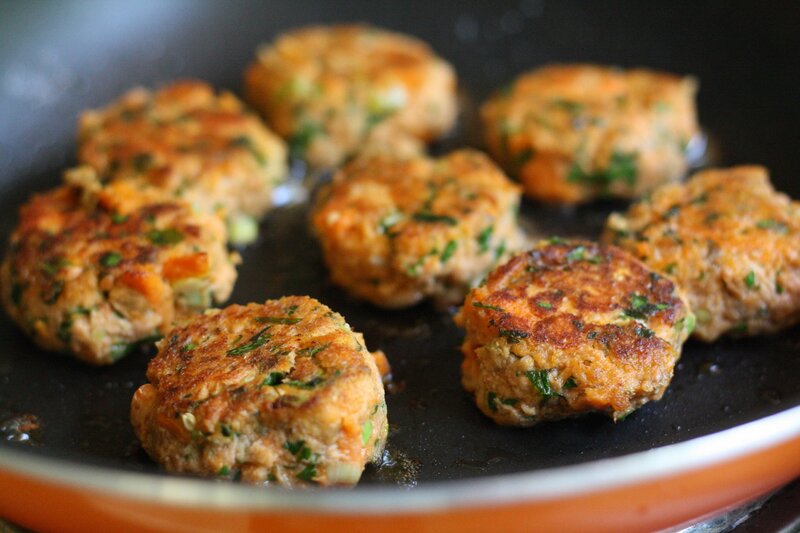 This is a 9 ingredient recipe for salmon patties without eggs. Per serving has 490 calories, 190mg sodium, 19 g fat, 35 g protein, 45 g carbohydrates and 13 g fiber. You will need 50 minutes to cook these patties. 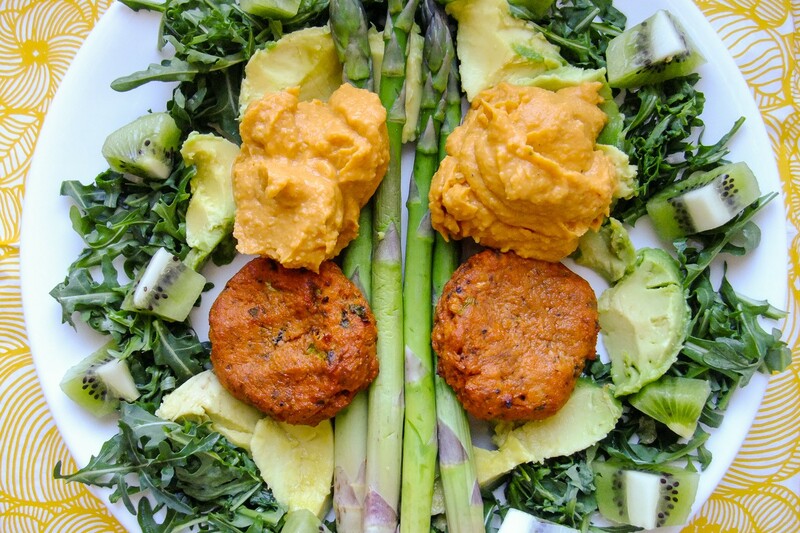 The following are ingredients you need to prepare 4 servings of ginger salmon patties. Place 1 tsp olive o﻿﻿il and sweat onion in a frying pan and heat until the onions soften. Add diced salmon, lemon zest and ginger into the pan. Season the mixture with salt. Remove them from the pan and shape them mixture into patties of your favorite sizes. Place the remaining olive oil in a frying pan and heat until hot. Dip the patties into hot oil and fry for 4 to 5 minutes. Remove the cooked patties from the oil and serve. 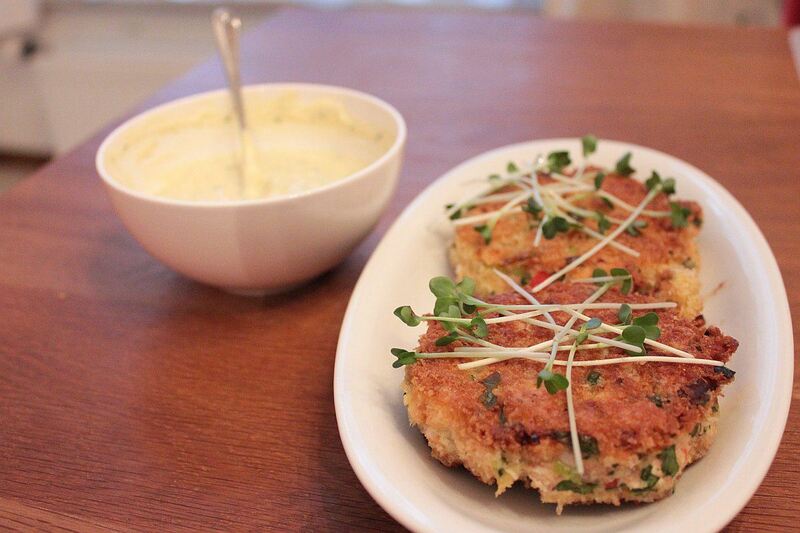 This is a 12 ingredient recipe for salmon patties without eggs. You will need 4 minutes to prepare these patties. The nutrient value per serving contains 420 calories, 140 mg sodium, 17 g fat, 26 g protein, 41 g carbohydrates and 6 g fiber. The following is a list of ingredients you need to prepare 4 servings of these salmon patties without eggs. In a large bowl, combine chili pepper, spring onion, cilantro, peas, mashed potato, 1 tbsp flour, curry paste and salmon. Season the mixture to taste. Shape batter into 8 flattened patties. Put the pieces on a plate and chill for 15 minutes. Dust the pieces with remaining flour making sure the excess flour is shaken off. Heat the vegetable oil in a frying pan. Place the pieces in the pan and cook them in two batches four to five minutes on each side until they turn golden brown. Remove patties from the pan and drain them on paper towels. Serve your patties with steamed broccoli, steamed rice and a drizzle of sweet chili sauce. Keep in mind that no egg salmon patties are baked but not fried. Per serving of these patties contain 130.5 calories, 7.2 g fat, 28.6 mg cholesterol, 190.5 mg sodium, 1.5 g carbohydrates, 0.2 g dietary fiber and 13.4 g protein. You will need 15 minutes to prepare and 45 minutes to cook the patties. 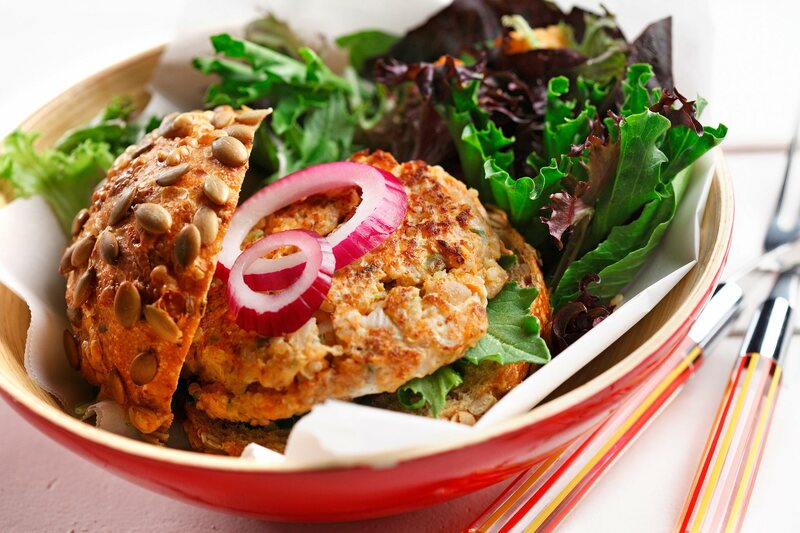 The following is a list of ingredients you need to prepare 7 servings of these salmon patties without eggs. In a medium sized bowl, combine salmon, tomatoes, onion and seasoning salt. I normally use McCormick to blend the mixture. In another medium sized bowl, combine stuffing mix, water and tomatoes juice. Combine all ingredients above in one large bowl, and let them stand for up to 10 minutes. Scoop the mixture and shape into patties each weighing 2oz. Bake the pieces for around 25 minutes. Remove them from the pan and let them cool. Served them with a dipping sauce. From the information that I have shared above, you have probably found it is easier to make salmon patties without eggs than you have previously thought. The recipes that I have shared above are not the only one you can consider for your family. There are several others you can choose depending on your test and preferences. Just feel free to say what you think about these recipes in the comment box below. If you enjoyed reading this article, I would also appreciate if you share it using the share button.